By downloading and/or installing this free font you agree to this license. 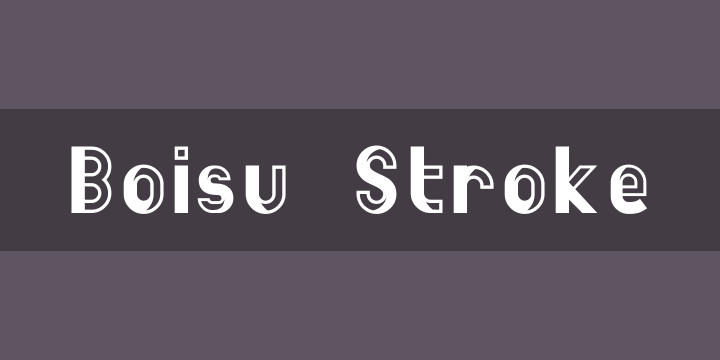 → This font is freeware. You can use it freely for all your personal and commercial work. → The font files may not be modified without written permission from Yann Gall. → This font may not be sold. → This font may not be redistributed, shared, repackaged without written permission from Yann Gall. → Do not share this font, instead, you may provide a link to my website or bechance profile. Please notify me if you do so. → Embedding this font in a PDF document is allowed. → Embedding this font in a web page using the CSS @font-face rules is allowed. → Embedding this font in eBooks, apps, games, or any other software is allowed once Yann Gall is notified and credited. → Except for your right to use this font, all other rights are owned and retained by Yann Gall. → Yann Gall is not liable for any damage resulting from the use of this font. 3. Show me all the pretty stuffs you did with my typefaces. Yes, I care! Boisu, a free industrial typography of 401 glyphs and 3 styles: Stroke, Fill & Full. ​​Localization western, central and south-eastern Europe as well as Pinyin. Proportional and tabular figures.